I love working on Teacher Appreciation Weeks as well as any type of appreciation event or item! I had a mom contact me for some last minute items to help with her schools Teacher Appreciation week coming up May 2-6. 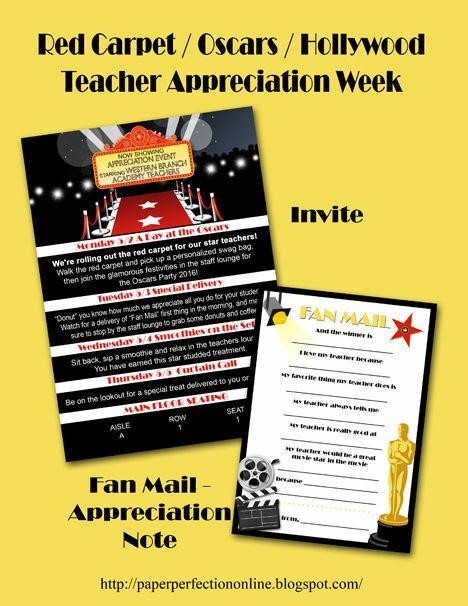 Here is an invitation letting the teacher's know where and when to find their daily gifts and a "Fan Mail" card that the children can fill out for their teachers. What a cute idea! If you like these items or need custom items for your next event contact Paper Perfection at jtanddolly@yahoo.com for pricing and details. I also have a few cupcake toppers that match these items located at this blog post here, and a few movie printables here and here.